Itchy ears are a common and irritating problem. The source of the itch can include yeast infection, dermatitis, excessive wax buildup, allergy or atypical dryness. Coconut oil may relieve some itching but it is best to first consult with your doctor to determine the cause of the itching to rule out yeast overgrowth or allergy; these conditions will not improve with coconut oil applications unless additional steps are taken. Coconut oil is solid at room temperature due to its saturated fat content. It is one of the few saturated fats that the body can process easily, which makes it an effective and healthful substitute for shortening or butter in moderation. Because the body requires healthy fats for optimum skin, joint and organ health, using the lipid-rich quality of coconut oil may improve skin health and reduce ear itching associated with dry skin, says master herbalist Rosemary Gladstar. However, coconut oil has a distinct coconut flavor that may be undesirable in some cuisine. Emollient oils can be helpful when dealing with itchy ears caused by dermatitis. To use coconut oil to combat itchy ear canals externally, gently heat a small amount of coconut oil. Test the liquefied oil on the inside of your wrist to ensure it is not too hot. Place four drops into the ear canal, tilting your head to allow the drops time to absorb into the dry skin of the ear. Do not stick any object into your ear for any reason. Coconut oil can be an effective carrier oil for the antifungal properties of garlic. According to author Matthew Wood, garlic has been used for thousands of years to curb unhealthy levels of yeast. To make your own garlic ear oil combine equal parts coconut oil with extra virgin olive oil that has been infused with pressed garlic. Heat gently for 20 minutes taking care to avoid burning or boiling. Strain the mixture well. Add four gently warmed drops to ear canals twice a day for at least a week after itching has passed to ensure yeast has been eliminated. Warmed oils, such as coconut oil, moisturize excessive levels of dried or hardened ear wax so that the small hairs, called villi, found inside the ear canal can persuade excess wax to exit the ear naturally. For stubborn wax, manual removal by a health practitioner may be in order. Some people with nut allergies may also be allergic to coconuts and their oil. 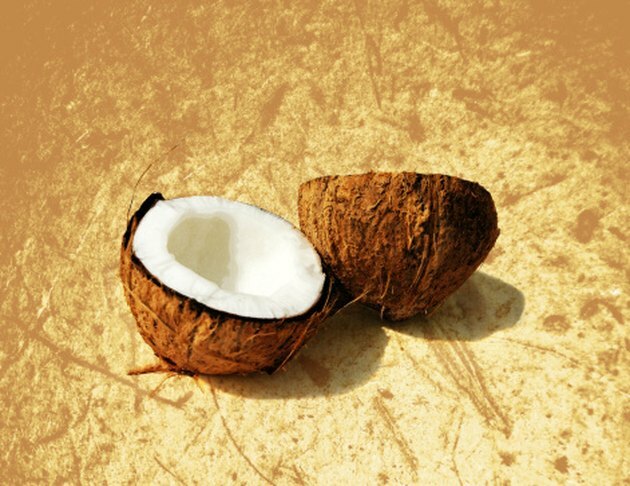 Always test a small patch of skin before using coconut in any capacity to avoid allergic reaction. What Causes Red Ears in Children?